One of the oldest tools, the hammer has evolved to fill a wide variety of roles beyond simple construction. Some types of hammers are highly specialized, and may perform tasks traditionally held by axes. Other types are versatile and have a home in any workshop. The parts of a hammer can be broken down into three main components. The head is not only the part you whack things with, but also includes the portion that fits over the handle. Least varied in design is the handle, which serves as the fulcrum and can be held to provide either more swing or more precision. Finally, the back part may consist of a claw, hook, or pein (also spelled peen). Chances are, you’ve heard of these hammers, and may even own a few. They are an excellent addition to any home workshop, and owning a full set of these will allow you to complete almost any task. Used primarily by engineers, the pein of this hammer is rounded. It’s commonly used for rounding the edges of metal pins and fasteners, closing rivets, and shaping metal. In past, it was a key tool used for a fabrication method called “peening”. As a result, it is commonly referred to as a machinist’s hammer. Check out the ball peen hammers we recommend. Perhaps the most recognizable of all hammers, the back of a claw hammer features a curved, forked claw that can grip nail heads, allowing the user to lever out nails. This hammer is so versatile that it can be found in any home or workshop. See our favorite claw hammers. Sometimes referred to as a lump hammer, this tool has a short, double-faced head similar to that of a sledge hammer. While not well-suited for commercial work, the club hammer is useful for driving steel chisels and masonry heads, as well as light demolition work. The head of this hammer is specially designed for minimal recoil and soft blows. It usually has either a solid rubber or plastic head, or a semi-hollow head filled with sand or lead shot. They can be used in everything from woodworking to automotive applications where they aid in dislodging parts, fixing small dents, and knocking wood together or apart without marring the surface. Closely resembling a claw hammer, the framing hammer has a straight claw and waffled head. It is named after its primary function, which is assembling house frames. The waffled head helps prevent slippage while driving nails, although it mars the surrounding wood, which isn’t seen once a house is finished. Check out our framing hammer top picks. The most common type of mallet, its rubber head allows for softer blows. It can be used on sheet metal, in woodworking and upholstery, and is gentle enough to force plasterboard into place without damaging it. This long-handled hammer has a metal double-head similar to a mallet, but designed for heavy, large blows. It can be used for driving stakes, or breaking up concrete and masonry, making it a popular demolition tool. This unusual hammer features two long, claw-like heads, one of which is magnetised. It is often referred to as an upholstery hammer, and is designed to hold a tack for placement using the magnetic end, then driving the placed tack using the non-magnetised end. You will likely never see some of these hammers. Many are used for very specific tasks and not commonly found in general-purpose hardware stores. A few of these hammers closely resemble more common hammers, except for weight and slight size or shape differences. Unlike what is depicted in popular fantasy games, the blacksmith’s hammer is a type of sledge hammer where the second head is slightly tapered and rounded. It is designed specifically for shaping white-hot steel against an anvil. Featuring a flat, square head on one side and cylindrical head on the other, this is another hammer commonly used by blacksmiths. It can be used for shaping metal on a block or anvil. Brass hammers have a thin, cylindrical double-head which is used for pounding steel pins without damaging the surrounding surface. It can be found in both automotive and woodworking shops. The claw of a bricklayer’s hammer doubles as a chisel for scoring, while the narrow head is capable of splitting bricks. This makes the hammer very useful in bricklaying and masonry projects. Also referred to as a masonry hammer. This unusual hammer resembles a meat tenderizer with an extended metal head. It’s used to add a rough texture to stone, which may have an aesthetic purpose or make stone walkways less slippery. The wedge-like pein of this hammer is horizontally-aligned. It can be used for starting panel pins or tacks without the risk of hitting your fingers. It is also used for shaping metal. A very unusually-shaped hammer, the chasing hammer has a bulbous-ended handle, rounded head, and small, round pein. It is used primarily for shaping metal jewelry.. This straight peen hammer has a very specialized end that more closely resembles a hatchet with a notch in the bottom. The notch is used for holding nails in place without damaging the drywall paper, and the blade of the pein can be used to chop off excess bits of drywall safely. This variation of a claw hammer has an extended neck on the head. This allows electricians to target nails embedded in hard to reach places. The engineer’s hammer was traditionally used for locomotive repair and features a rounded head and cross peen. The term is also commonly associated with heavier ball peen hammers and hammers which have a rounded double head. One of the more unusual types of hammer, the hatchet hammer (sometimes referred to as a half-hatchet) has an axe blade instead of a peen. It can be used for a variety of tasks and is thus well-suited for survival and emergency toolkits. The head of this traditional mallet is made of a solid, slightly tapered wood block instead of metal. It can be used for driving chisels or gently tapping wood joints together without marring the surface. This hammer features a conical pein and solid head. Used for work on telephone poles, it is perfectly designed for driving lag screws and hammering bolts. Sometimes referred to as a body mechanic’s hammer, this hammer features a flat head and a long pein tipped with a conical die. It is used with a dolly (a curved type of anvil) to remove dents in car panels. While not technically a hammer, a nail gun (or nailer) does the same main job as a claw or framing hammer. It drives nails into wood or other material usually by way of compressed air (pneumatic). While less common, cordless, battery powered versions are also available. Nail guns are common in construction or DIY projects where a large number of nails need to be driven into a surface. Also known as a rock climbing hammer, the straight pein of this hammer contains a hole for removing pitons. The head may be anvil style and heavy or lighter with a hollow handle, depending upon the type of rock climbing intended. Heavier models will drive more pitons quickly with less fatigue, but lighter models are used when driving fewer pitons to reduce weight loads. Many piton hammers have interchangeable heads to allow for a wider range of climbing methods. These hammers have a slightly convex head and a pein tipped with a cylindrical die. It is used for fine-shaping and smoothing metal over a planishing stake, allowing the metal to take the shape of the stake’s head. A power hammer is a large stationary forging hammer that uses compressed air to move a large piston up and down to “hammer” and shape the material below. It’s similar to how a hydraulic press works but can easily move the piston up and down a couple hundred times a minute. Used for forging steel materials into a variety of different shapes. This is the professional’s answer to a claw hammer, featuring a straight claw instead of curved and heavier weight. It can be used to rip apart materials during construction and demolition (hence the name). In addition, it works well for framing and has been used by contractors for everything from digging holes to measuring for outlet boxes and everything in between. Also referred to as a pick hammer, this small tool has a flat head and either a chisel or pick on the back. 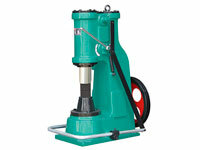 They are most commonly used in geology and historical excavation to break small rocks. The chisel is used for a variety of tasks, including splitting soft rock, removing vegetation, and creating small holes. The pick variant, often called a geologist’s pick, is able to split harder stones. Bricklayers sometimes use rock hammers to break up old brickwork joints. Featuring a vertical chisel and pick instead of normal heads, these hammers are used for removing scale, rust, and various types of hard coating from boilers and other surfaces. Pneumatic versions range from single-headed to triple-headed models and function more like a jackhammer. Scutching is the process of removing old mortar from bricks and paving. The hammers used for this have either one head and a chisel-like slotted scutch comb holder or two scutch comb holders. The holders can hold scutch combs which function like toothed chisels, or droves. Which is used for a job depends upon whether the user prefers a hammer or multiple scutching attachments. Commonly referred to as a roofing hammer, these feature a square head, spike, and usually include a small claw on the side of the head for pulling out nails. The spike can be used for putting nail holes in slate and shingles, which are often too fragile to drive nails through without an existing hole. This round, double-faced hammer has a rubber, plastic, or copper face that may sometimes be interchangeable. It’s designed to strike more delicate materials, such as chrome without causing damage. These long-handled hammers are used for driving railroad spikes from the opposite side of the tracks. The two heads are long and thin, being either symmetrical or (more commonly) with one end being longer and thinner than the other. The standard version has a squared, tapered end opposite the main driving head, while the bell variant had cylindrical heads. This mason’s variant of a sledge hammer is specially designed for breaking up stone and concrete. Instead of a double-head, the striking face is oval, and the short straight peen functions as a napping face for making scoring lines. This is essentially the same as a cross peen hammer, except the pein is vertically-aligned. While it may also be used to start nails, it is better reserved for shaping metal. These hammers have a square head and sharpened cross pein. They are used for completing seams and setting a rolled edge in metalwork. Perhaps one of the most unusual looking hammers, the toolmaker’s hammer has a ball pein and rounded head. The central portion of the head contains a magnifying glass. It is used for performing delicate work in machine shop. 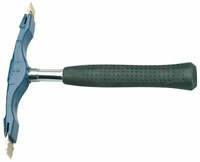 Trim hammers have a straight claw and are smaller than normal claw hammers. Sometimes referred to as a finish hammer, these have a smooth face for driving trim nails without damaging the surrounding surface. This peculiar hammer (also called a chipping hammer) has a round chisel at one end and a vertical pein on the other. Its handle has an unusual spiral design that looks more like a spring. This helps dissipate heat, while the hammer itself us used to remove slag from welding points once the weld bead has had a chance to cool. 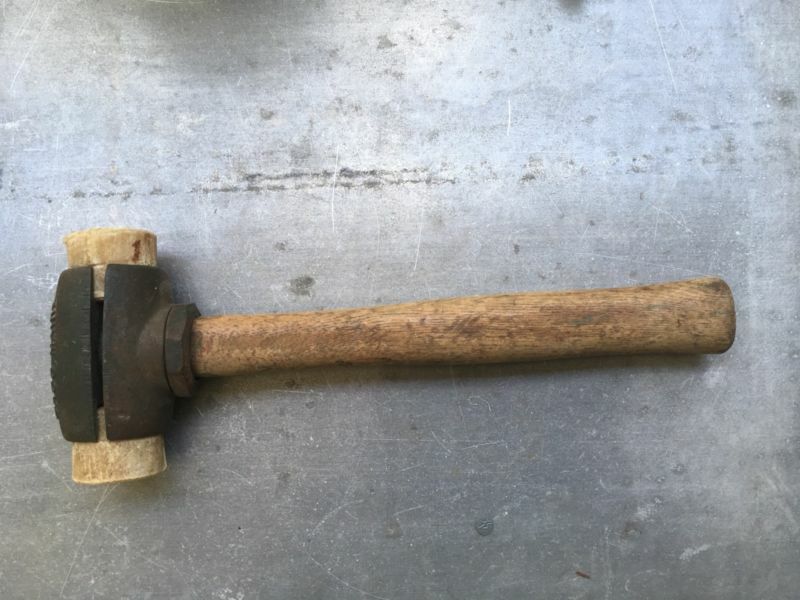 Interesting stuff but no answer to my question about a vintage hammer with a double head with a recess in each face about a half to three-quarter inch deep, forming a cupped shape. The side has a Rawhide brand on it with a wooden handle. Are you able to identify this unusual hammer? The hole is used for bending metal.